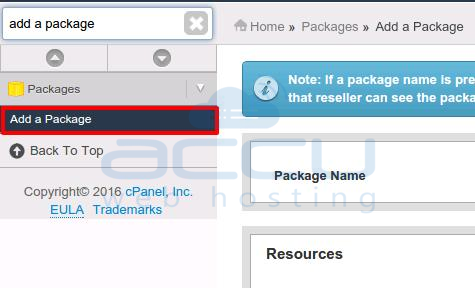 How to create a package for cPanel account? In WHM, each cPanel account is assigned with a web hosting package, which defines the hosting resource limits and several other account related settings. It can limit hosting resources, like disk space amount, bandwidth, number of FTP accounts, email accounts, databases and subdomains. It can also set some important account specific settings like, theme, language, CGI access, Shell access, etc. Following tutorial will provide you step by step guidance to create a hosting package from WHM. Login into WHM via URL https://VPS_IP_Address:2087. Go to Packages → Add a Package. Give an appropriate name to this package. Set your desired values in hosting Resources fields. Specify your choice of Settings you wish to apply with this hosting package. Click on Add button to complete package creation. Now, you can use this package while creating a cPanel account. How to Install SSL Certificate via WHM? How to enable/disable Apache & PHP modules using EasyApache4?